← How to draw an ellipse-shaped comment in my pdf file with VeryPDF PDF Editor? How to convert pcl to pdf? Do you have a mass of bills or notes stored in pcl format? Do you have to process a number of documents stored in pcl format? 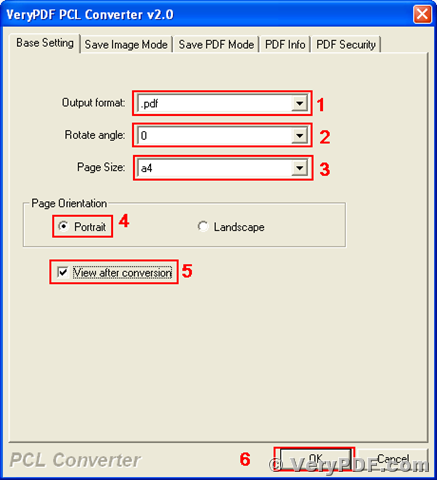 Are you going to convert those documents of pcl to pdf for publishing or transmitting? VeryPDF PCL Converter must be your best choice. VeryPDF PCL Converter is a powerful program that supports to convert Printer Command Language files to Portable Document Format, pcl to pdf. VeryPDF PDFPrint has both GUI and command line version. This article will present some descriptions of its GUI version. You can get your VeryPDF PCL Converter at http://www.verypdf.com/pcltools/index.html#dl. Install it into a directory of your system and you find it with name of “VeryPDF PCL Converter 2.0” in your application list. You can follow the menu path to launch the application. Select [start] –> [All Programs] –> [VeryPDF PCL Converter 2.0] –> [VeryPDF PCL Converter 2.0], and a dialog of registration will pops up. You can press the button of “try” to evaluate this program without any function limitation. You can also launch the program by double-clicking on the icon of the program in the directory where VeryPDF PCL Converter is installed. After pressing the “try” button or registering the software, you will see the main window of VeryPDF PCL Converter as presented in the following screen snapshot. 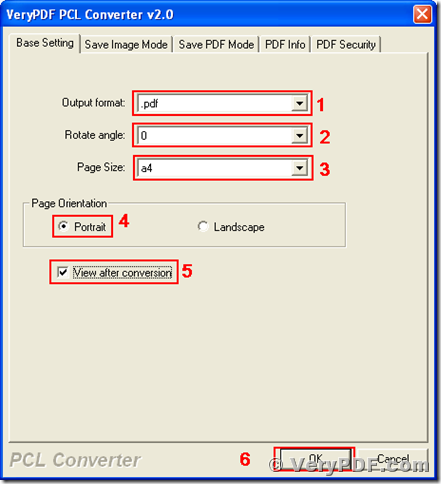 Now you can convert supported formats, such as, pcl, pm, pxl and px3, to pdf. Before converting, you need to add those files into the file list in the main window. There are four methods of adding files to the file list. Select menu [File] –> [Add Files], and then browse to the files in the popup file picker dialog. Select menu [File] –> [Add], and then browse to the directory where the files are stored. Press “Add File(s)” button in the main window of PCL Converter, and then browse to the files to convert. Drag those files from the Windows Explorer and drop them into the file list in the main window of VeryPDF PCL Converter. After adding the files to be converted into the file list of the main window, next step is to set the target format. For this article, the target format is “PDF”. There are two methods to start the dialog for setting the target format. Select menu [File] –> [Settings], and a setting dialog titled “VeryPDF PCL Converter 20” will pop up. Press the button of “Setting” in the main window of PCL Converter, then comes out the same setting dialog as the first method. In the dialog as displayed in the following screen snapshot, select the tab of “Base Setting”, choose “.pdf” in the dropdown list of “Output format”, select “0” in the dropdown list of “Rotate angle”, select “a4” in the dropdown list of “Page Size”, select “Portrait” radio button in group box of “Page Orientation”, check the “View after conversion” check box and then press “OK” button. Before press the “OK” button, you may set other parameters in other tabs, such as “Save PDF Mode”, “PDF Info” and “PDF Security”. Then come to the main window of PCL Converter after completing the settings above. Press the “start” button in the main window of VeryPDF PCL Converter, and choose a directory for storing those target files in the popup “Save As” dialog. Those files in the file list will be converted from pcl to pdf, pxl to pdf and px3 to pdf. Using the similar method, you can convert your files of pcl to formats of jpg, ps, bmp, etc. There are more function descriptions of VeryPDF PCL Converter at http://www.verypdf.com/pcltools/pcl-tools-help.htm. If you want to use the official version of PCL Converter without any limitation, please go to http://www.verypdf.com/order_pcl2pdf_end.html and buy one license for your software. How to convert pcl to pdf using a command line? How to Convert PCL to POSTSCRIPT? This entry was posted in VeryPDF Blog and tagged PCL Converter, PCL to PDF, PCL2PDF, px3 to pdf, pxl to pdf. Bookmark the permalink.